Rep. Joanna Cole (D-Burlington), right, congratulates House clerk Don Milne (seated) Saturday after Milne's pending retirement was announced. To his left is Bill Magill, who was elected to replace Milne. Don Milne, who first went to work in the House clerk's office in 1961, announced Saturday that he will retire in October. House members immediately elected his longtime assistant, Bill Magill, to replace him. "You will be an extraordinarily tough act to follow," said Rep. Susan Hatch Davis (P-Washington), who represents Milne's hometown of Washington. After the announcement, House members gave Milne a lengthy, standing ovation. Milne, 80, has served as House clerk since 1993. 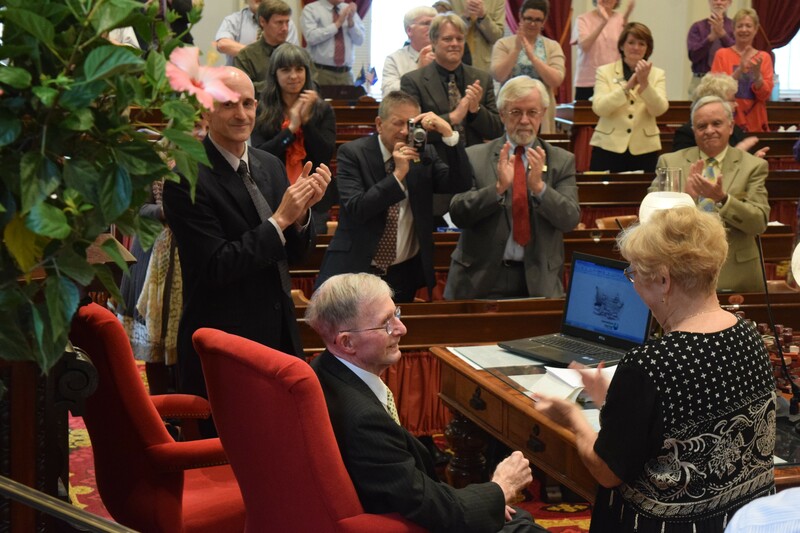 His retirement ends a lengthy family connection to the Vermont House. Milne served as a member of the House in 1966. His wife, Marion, who died last August, served in the House from 1995 to 2000. Their son, Scott Milne, won the Republican nomination for governor last year and nearly defeated Democratic incumbent Peter Shumlin. Scott Milne and other family members watched from the House balcony as the family patriarch was honored. Magill, 39, was elected without competition. The Waitsfield resident has been filling in for Milne during periods of illness in recent months. He joined the office in 2003 as assistant clerk.